I pay good money for art instruction and inspiration--purchasing books and magazines, enrolling in classes and workshops, and even my once-in-a-lifetime (thus far!) retreat experience. So I don't feel quite so badly about focusing for a post on some freebie resources that I have accessed, which you can access as well. I can be a bit of a miser at heart, so finding high-quality, inspiring, and instructive resources for free can really make my day! Just yesterday on Facebook, a post appeared for Sketchbook Skool, which seems to have been created and facilitated by the wonderful Danny Gregory and Koosje Koene. While there are many different Kourses (they love to spell everything with the letter "k"!) 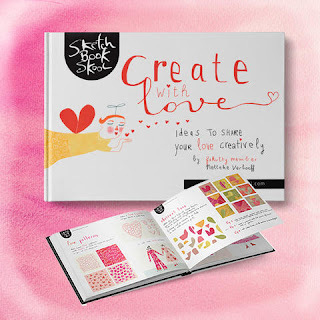 available for purchase, this Facebook post offered a free eBook entitled, Create with Love: Ideas to Share Your Love Creatively. Just in time for Valentine's Day, Nelleke Verhoeff offers fun ideas like creating faces from hearts, and incorporating them into collage-style postcards; doodling with lips and kisses; creating a "personal pie" (you'll have to see the eBook to understand! ); creating sticky note love doodles and a love garland. There are projects for poems and patterns, as well as alphabets and abstracts. All fun, all free. 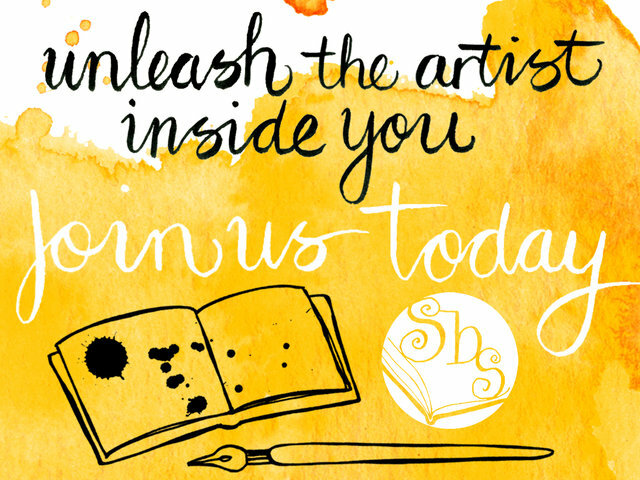 After I signed up and received my free eBook, I received an email inviting me to take a free Sketchbook Skool Kourse. It didn't take long to watch through each of the lessons, and with the unlimited access, I can go back and take my time, working through the exercises that were presented. There is a fun exercise about recording your day in the style of a comic book, instruction on sketching using negative space, as well as instruction on continuous line drawing. These are all great exercises that could keep a beginner sketch artist (and a veteran, too, I would imagine) busy for quite some time as they began a "sketch habit." 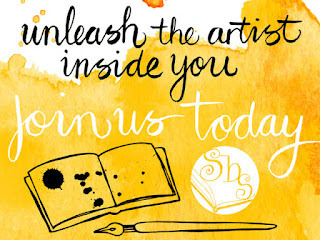 The Sketchbook Skool blog also offers a variety of free inspiration and instruction through the text, pictures, and videos incorporated into its posts. Finally, I made a list of all of the instructors mentioned throughout the Sketchbook Skool web site, and discovered that plugging them into a YouTube search uncovered hours and hours and hours worth of free videos offering their instruction and inspiring looks at their own sketchbooks. I think it is very important to support art instructors' effort to offer quality instruction through their for-sale products. But I also know that costs can sometimes be prohibitive for people who want to explore different or unfamiliar fields of art or creativity. 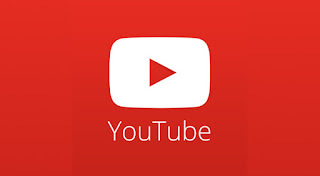 I continue to be excited about all of the resources that these same talented and dedicated artists have made available for us for the low cost of an Internet search. 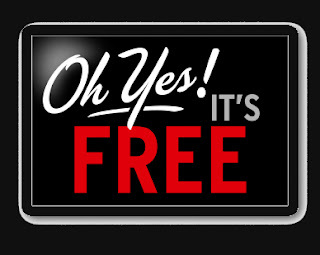 I just couldn't keep these free resources to myself! Yesterday, I took a beginning watercolor painting class with instructor Terry Collington at the Middletown Library. The workshop was yet another offering of the Makery@Middletown series, through which I have taken papermaking, painted river rocks, and a jewelry-making class in the past. Terry brought us to the front of the room to offer demonstrations of each step of the painting process, and our ultimate plan was to complete a watercolor birch tree scene, similar to the sample she offered us. My finished project won't take the watercolor world by storm, to be sure, but it's always a good day when I get to fling a little paint around. Here is the piece under a black mat to give a sense of what it might look like if it were framed. I believe the instructor's word was "bland" when it came to my sponge painted background; I tend to agree. I brought the painting home, spattered some blue paint over top of it, and cut it into two postcards and a bookmark. After adhering some cut-out phrases from magazines, I outlined the papers in black Sharpie pen, and I'm pretty happy with the results. I am a mixed-media artist at heart, and will seldom be satisfied with a straight-up watercolor painting that hasn't been "messed around with" in some way!